As the bookies' odds would suggest, Conor McGregor may not be in the most danger when he takes on Dennis Siver at UFC Fight Night 59 on Sunday night. But that doesn't mean he can't make it difficult for himself. 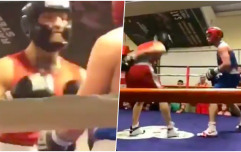 Standing in front of the talented Taekwondo black belt and brawling is not a good idea for "The Notorious" as all it takes is one spinning back kick to finish a fight for the Mannheim fighter. We've highlighted some key areas to look out for when the pair of them finally touch gloves (they're never going to touch gloves, are they?) on Sunday. Many fight fans see the striking battle between McGregor and Siver as a clash of the two best-known traditional martial arts in Karate and Taekwondo. Dennis Siver's signature move, with which he has secured finishes twice but throws often, is the spinning back kick. This is a technique whereby he plants his lead leg (left), looks at the head of his opponent and feints as if to throw a left hand. He then turns his hips and generates tremendous power before landing the heel of his right foot to the body of his opponent. Siver's spinning back kick is vicious but, because it is a Taekwondo technique, it is telegraphed to the point that faster strikers can get out of its way on time and is heavily reliant on a flat-footed fighter, something which Conor McGregor is not. The perfect antidote for a Taekwondo-based fighter who sacrifices unpredictability in favour of power is movement. Conor McGregor is more of an advocate of Karate-based striking which is a little less powerful but more accurate and surprising. Siver, especially a 36-year-old Siver, is likely to attempt to throw his patented spinning back kick which he will telegraph as always and find himself missing McGregor, just like Max Holloway did in the first round of his bout with the Irish featherweight. We concede that Conor does sometimes throw spinning techniques (he throws bloody everything) and, in fact, the spinning back kick was the first strike he attempted in his UFC Dublin bout with Diego Brandao, albeit from southpaw. But one element of McGregor's stand-up that Siver lacks is the snapping Karate style of striking. "The Notorious" tends to mix up the powerful Taekwondo and Thai techniques with the more fluid strikes of Karate. His strikes, especially his kicks, often come with much less wind up than Siver's and that is just one reason why Conor's stand-up gives his opponent far less time to react - a basic tenet of Karate. 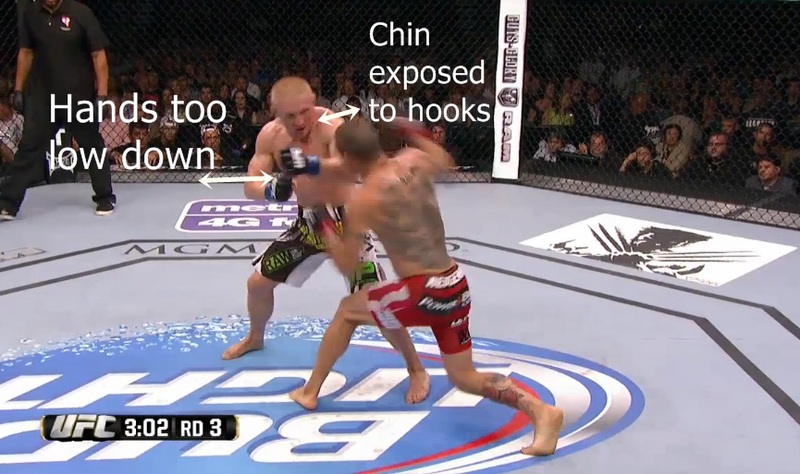 Dennis Siver has had trouble in the past with tucking his chin properly after he throws a combination. It would be an exaggeration to say that he sticks his chin up in the air but with a striker as deadly as Conor McGregor, if your chin is not protected fully then you're going to get caught. In his TKO loss to Cub Swanson, he failed to employ the most basic boxing philosophy of keeping your jaw safe. 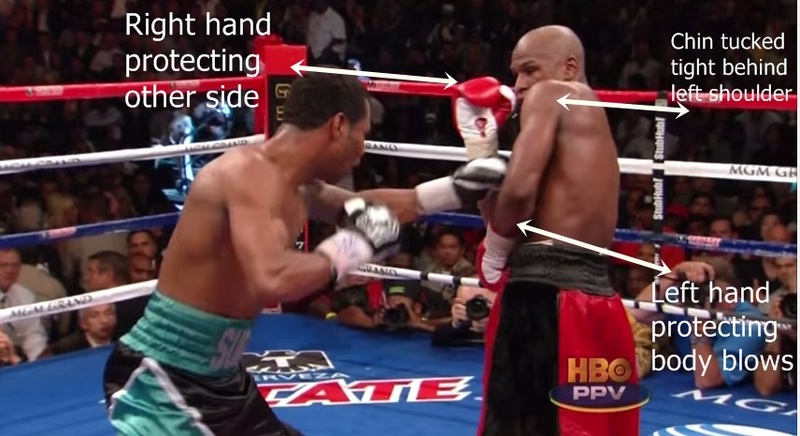 The main reason that Floyd Mayweather Jr, one of the greatest boxers ever to grace a ring, is so successful is because he has perfected the shoulder roll technique where he hides his chin behind his lead arm by shielding it with his shoulder while, at the same time, protecting himself from all remaining danger using his rear hand. While it's unfair to compare a mixed martial artist's striking with that of a boxer, the above graphic is used to show the ideal defensive stance to minimise the damage from the hands of an opponent. And it's defensive stances like above from Dennis Siver that gets him caught out and which is what finished him off against Cub Swanson. If Siver holds his hands like that against a boxer as good as McGregor, "The Notorious" will easily paw his way past his guard before connecting with a straight or a hook that will put Siver down, just like he did against Diego Brandao. One thing that's common to many of Dennis Siver's losses is that when he gets uncomfortable on the feet, he often stays uncomfortable and tries to run forward in frustration to force some strikes which is a big no-no when you're up against someone who's any bit versed in stand-up. His tendency to stand straight on and attempt a bum's rush simply increases the size of the target for his opponents, limits his movement and gives his opponent more time to hit him. In terms of motion, Siver also has an awful habit of moving backwards and forwards which gives the guy who's trying to hit him a much better sense of where he's going to be. Donald Cerrone took full advantage of that plodding, easily predictable movement and timed this right hand to perfection which dropped Siver. Conor McGregor employs a much more fluid type of movement and has been very vocal in how he views other fighters' movement as "basic". "The Notorious" has a fighting style not dissimilar to that of middleweight legend Lyoto Machida who uses a Karate style to minimise the amount of damage he takes. Conor McGregor uses this same technique which he showed in his UFC Dublin meeting with Diego Brandao. Rather than move straight back or straight forward, "The Notorious" cuts angles to make him all the more unpredictable. As you can see from above, the German is easily frustrated when he comes up short in combinations. He rushes his opponents when that happens which is just not wise. Most, if not all, of Siver's KO/TKO losses have come when he has attempted to abandon technique and swing wildly at whoever he is fighting. McGregor should, and probably will, take advantage of Siver's tendency to get wound up so that he can get the German to open up defensively. 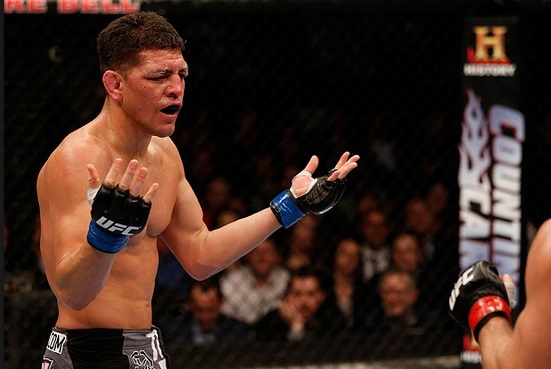 The Dub is famous for his Diaz-esque dismissive reaction to his opponents striking and does everything he can to annoy his opponent. Siver doesn't seem the hardest man to irritate so expect him to react by brawling with McGregor, which is just what "The Notorious" would want so that he can capitalise on more glaring openings. One element of movement that deserves a category of its own is the notion of head movement. There's no use in staying on the balls of your feet to dance around and cut angles if you're keeping your head rigid. Bobbing and weaving in striking is a must if you want to minimise damage and it's the fighters who get hit less often who enjoy the longer careers. As we eluded to in the first section when we spoke about Siver's defensive stance, he keeps his chin too high but another deficiency in his defence is Siver's tendency to keep his head fixed in the same position when moving his feet. Melvin Guillard was able to time where Siver's head would be when they met in 2008 and "The Young Assassin" took full advantage by KOing the German. Elite level strikers, which Conor McGregor undeniably is, continue to shift their head off the centre line so that an opponent doesn't have the time to aim and connect in the same spot. When McGregor took on Dustin Poirier in September, he kept his head on a constant swivel and was able to duck his head to the right and by the time that Poirier threw a hook, McGregor's head was about a foot to the left again. This technique ensures that, even if you do get hit, the majority of the time it's just a grazing shot because your head is in constant motion and moving with the strike rather than against it. Possibly the best example of flawless head movement in mixed martial arts was that employed by Anderson Silva in his bout against Forrest Griffin where he was so confident in keeping his jaw out of danger that he held his hands by his hips (not recommended but look at that head movement). In terms of grappling, neither fighter is a slouch with Conor McGregor holding a brown belt in Brazilian Jiu Jitsu and Dennis Siver being the proud owner of a purple belt in BJJ and a green belt in judo. Don't be at all surprised to see Dennis Siver come into the octagon on Sunday with a grappling-oriented gameplan. Nine of his victories have come by submission and both of Conor McGregor's losses have come on the ground so a takedown would make sense from the point of view of Siver who has 13 UFC takedowns to his name. Wrestling has been the only area in the arsenal of "The Notorious" that has been questioned just based on the fact that he has never fought an elite level wrestler but Siver's not one of them. Siver does have decent takedowns but, as we learned from McGregor's Dublin meeting with Diego Brandao, "The Notorious" has underestimated takedown defence. When Brandao, who is likely a better grappler than Siver, had a hold of a body lock and looked to have all but sealed a vital takedown on McGregor, the Irish fighter exploded and reversed the position with ease and work from his opponent's guard which is a place he is very comfortable. 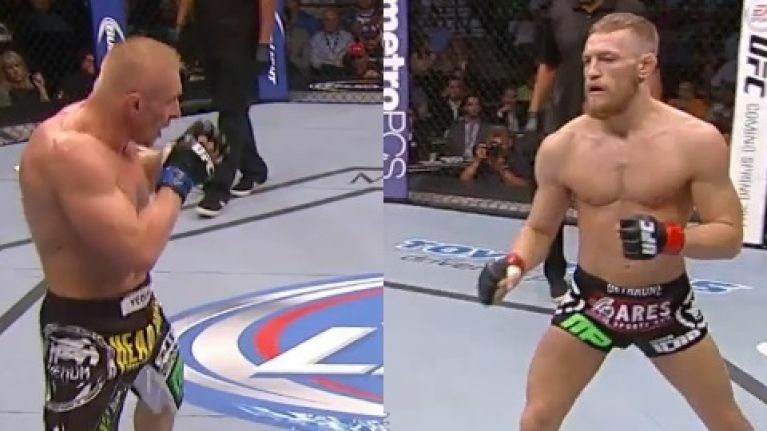 As well as that, due to McGregor's amazing striking performances, people forget that Conor outgrappled Max Holloway when they met in August 2013 so "The Notorious" is not afraid to take any fight to the ground himself. To look at Dennis Siver, he's so thickly muscled that you'd be forgiven for mistaking him for a body builder. While those muscles might look great when he's sunbathing, they are a hindrance when it comes to longer fights. Neither fighter has seen the championship rounds in their fight career but you'd favour McGregor if the bout does go to the fourth and fifth round due to his youth and leaner physique. Siver's thickly muscled frame will require more oxygen to fuel him than McGregor's so, in the unlikely event that this fight goes past the third, keep an eye out for Siver's pace to slow as his arms fill with lactic acid and his striking output diminishes as his punches lose the pop that they might have had in the first. That could also force Siver's hands to drop and leave his head open to the pinpoint straight punches of the Irishman. To be fair to Dennis he sometimes can grow in stature as the fight progresses but I think that his age, combined with his physique, will not be conducive to a five round fight. Meanwhile, Conor McGregor has displayed no cardio issues in his fight career which is still in its infancy considering he's just 26 years old and looked fresh as a daisy after his decision victory over Max Holloway, the first and only time he's required the judges' scorecards. Despite an injury and a grinding second round, McGregor managed to pass to mount without a bother in the third round and dominated the end of the final five minutes. We can talk about technique, stances and footwork all day but the main question ahead of this Sunday's main event in Boston is whether or not Siver's chin can withstand the damage that McGregor will be attempting to put on it. I would put forward that Conor McGregor is the hardest hitter in the featherweight division, apart from the champion Jose Aldo, and that Dennis Siver has never faced a striker of McGregor's caliber, especially since his drop to 145lb. If you look at McGregor's last two fights, he's finished both Diego Brandao and Dustin Poirier with punches that weren't the cleanest strikes in the world. It shows the power that "The Notorious" possesses that he can just graze you with a punch and you go down and with Siver's history of going down when hit cleanly, Sunday night could be a short one for Dennis Siver.